Even if the grass is green on the other side, we often lose sight of the green grass under our own feet. After vet school, Ryan Dunning recognized his passion for his native state of Arizona and the versatility that being a small animal practitioner allowed him, and has been thriving on his own green grass ever since. Having experience working in every aspect of the field from tech assistant to the receptionist, he is now the Medical Director at his childhood veterinary clinic. Another reunion episode, we are diving into everything from general practice to family, balance and why you should be sitting on the floor during all of your appointments. Ryan has a wealth of knowledge for those entering the veterinary field, those looking to make a switch, and those who have been thinking about reaching out to an old classmate. 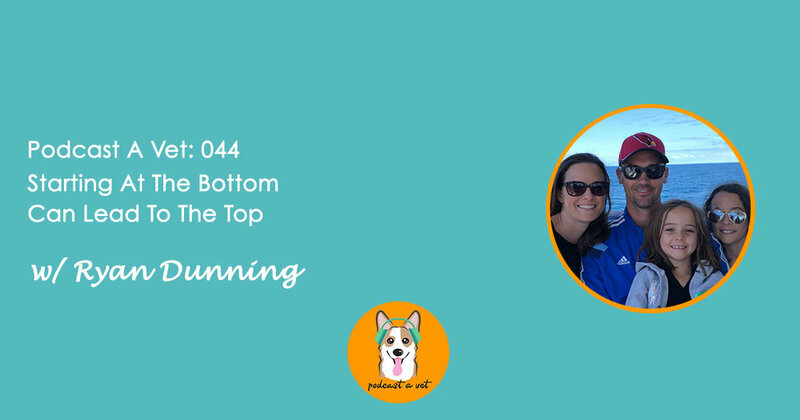 Everything from creating a lasting legacy, to how to continue to grow in the field and why you need to be honest with yourself and your colleagues first. A great model for success in so many ways, Ryan is sharing his inspiring vision with us today. By continuing to grow, learn and avoid your old patterns, this episode is sure to help guide you in the right direction. What are your thoughts on today's episode? Let us know in the comments below! Enjoying these stories? Consider supporting Podcast A Vet on Patreon & check out our awesome patron-only perks! Join our free community of dedicated vet professionals looking to improve their practices and lives in our free Facebook community! We'd love it (and you) if you would take 1 minute and leave us a review on iTunes!